The process begins with the church providing preliminary information. [To complete a preliminary loan questionnaire, click here.] 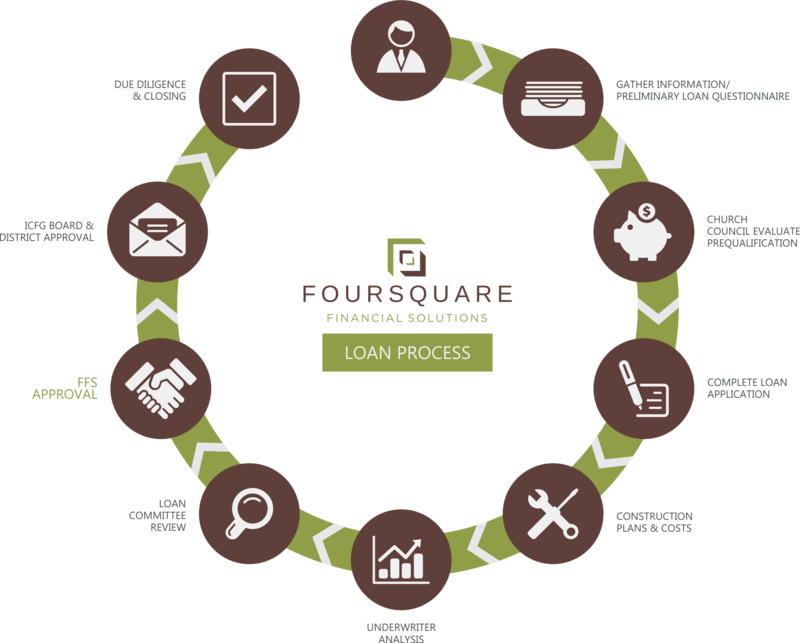 Our Credit Analyst then evaluates that information to see how Foursquare Financial Solutions Loan Fund might be an asset to the church. After receiving all preliminary information, the preliminary analysis is completed and the church receives a high level overview of the potential loan terms (such as interest rate options, amortization period, loan term, amount) for discussion with their leadership council and determination if the church wants to proceed with making a formal application for the financing. If the decision is made to proceed with formal financing, the church receives a loan application to complete and a checklist of documents to provide. Once all information is received from the church, it typically takes 3 to 4 weeks for our Credit Analyst to prepare the credit memo and present the request to the FFS Loan Fund Board for approval. If the loan is approved by the FFS Loan Fund Loan Committee, the church will receive a formal commitment letter detailing the terms and conditions of the loan approval and will have 30 days to decide to proceed with the approved loan by signing and returning the commitment letter to FFS Loan Fund. After receiving the signed commitment letter, there is a dual-track process, where ICFG Board approval will be requested by the ICFG Properties Department, and FFS Loan Fund will initiate the closing process for your loan. We understand that time is of the essence in lending, and our goal is to help you move through the lending process and obtain your answer as quickly and efficiently as possible. Typically it takes 3 to 4 weeks for both ICFG approval and for the loan to be subsequently closed. With construction loans, sometimes closing can take additional time due to the increased due diligence requirements both with FFS Loan Fund and ICFG. Be assured that you and your church will have experienced FFS Loan Fund staff to help you through the process.